"At the center of the cathedral stood a model of Heaven called the Golden House. Its roof unfolded like a flower to reveal a human-sized hollow, in which the body of poor Prince Rufus lay shrouded in gold and white. His feet rested upon the House's blessed threshold; his head lay cradled by a nest of gilded stars." I recently looked at a bunch of literary agencies' websites and their criteria for submission. Most only want writers to submit the first couple pages of their manuscript. It's easy to see why. From the first paragraph of Seraphina, readers can already tell that the book is an amazing book, both the writing and the plot. 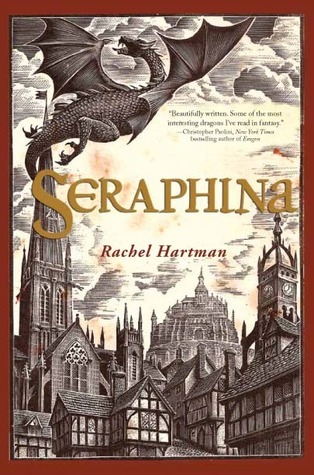 Seraphina is a YA fantasy book, set in the kingdom of Goredd, where dragons and humans co-exist. Seraphina Dombegh is a normal girl, or at least she seems like it. She's lost her mother, but then again, she's never really known her mother, since Seraphina's mother died giving birth to Seraphina. Seraphina takes music lessons from Orma, which leads to Seraphina becoming the assistant to the court music director. Things become complicated when Prince Rufus is murdered, by what seems to be a dragon. Tensions have never been higher since the dragon ambassadors are about to visit the human court. Seraphina has her own secret to hide, while unraveling the web of intrigue behind Prince Rufus's murder and the bigger picture. I haven't read such a breathtaking YA fantasy book since early last year when I got the ARC for Daughters of Smoke and Bone. They're both wonderful books, but Seraphina blows your mind away by the language and also the world that Hartman creates. The books are set in an alternate universe, one in which dragons and humans co-exist. Forty years ago, the dragons and humans signed a peace treaty to end the war between the two sides. Each side look down on each other, but that sentiment has been fading. Hartman not only created a different world, but also different terms and language. It's a little reminiscent of Christopher Paolini's Inheritance series (the book had a quote from him, with him saying that it was one of the best YA fantasies that he had read) but it's better. While Eragon created a world with dragons, it's Seraphina that finally takes readers onto a journey that's hard to escape from. The book also explores some philosophical questions such as what makes humans human? Dragons and humans co-exist in the same world, and in that world, dragons can take on a human shape. What distinguishes them from each other? Can they be distinguished? Hartman shows us that the differences are often murky and the two are often more similar than they are different. Other themes that are explored are familial ties and loyalty. The book explores so much, and so much depth, all without becoming overly cliche. It's amazing! It's so delicate, but yet so powerful! Oh the juxtaposition and my inability to coherently express my love for this book. It was so good that I devoured it like a dragon (har har har) like around 5 hours. I couldn't stop! Okay, I'll stop being cliche and what not... Please read the book! You can find a prequel of the book, here, on Random Buzzers (scroll down to read). P.S Just checked on Twitter, and it made number 5 on the New York Times Bestselling List! Go buy a copy now!